I bought this necklace off Etsy - a bit eccentric, I know. 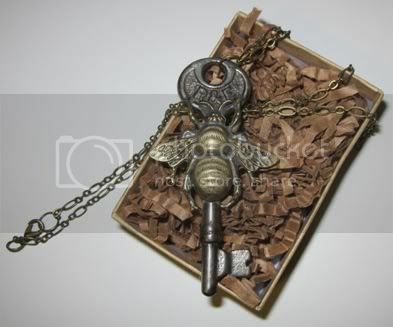 But bees and skeletons keys are two of my favorite things in the world. I was looking for a necklace with a key, and when I saw this one, I knew I had to have it! I don't usually buy myself frivolous things - I'm all about functional gifts and rewards. So this was a pleasant change. (1) Weighed in at 196 on Friday. Eating well, moving plenty, staying hydrated. I feel great! (3) My long run yesterday was 3.5 miles, which I did in 34:03 (a 9:43 pace). It's a few seconds per mile slower than I'll need to do at Saturday's race to finish sub-30. But I'm pleased with it, for sure. (4) Got paid today, put most of my check immediately into my savings, wrote out a budget for the rest! Don't anticipate too many big expenses this month - besides a coat, since my 4X and 2X coats from last winter got donated back in Chicago. I wore a dress to last Monday's book club meeting! When you're losing weight and dropping sizes so quickly, it's a bit easier to feel confident and lovely, but since my plateau, I've started feeling more self-conscious about my body. So to wear a dress in public was a fairly big deal. I felt pretty darn fabulous! I'm always on the lookout for new ways to get out of a slump, be it emotional or physical. Going for a run is always great - there's an incredible freedom of thought that comes when you hit the pavement for mile after mile. Writing picks me up too - either blogging, or actually writing on paper (which can be quite cathartic). My main tactic lately has been to try and focus on how many things are so good instead of fixating on the few things that are not. In spite of the rough patch when I transitioned from Chicago to California, I'd say I'm naturally positive - optimistic to a fault, I'd say. I always see the best in situations, which can be a bad thing sometimes because I tend to see only positives and not glaring red warning lights. I'm on Holiday right now, if you could go away anywhere tomorrow (and work wouldn't get weird) where would you go? The south of France, I'd love to explore there. Or Brussels - some of my students did a lesson on Belgium and now I have this intense urge to go there! LOVE the necklace it is so steampunk! Ommmmgggggg, Mary, you look ADORABLE!!!!!!! #Love that dress!!!! You look great in your dress. You look great! Exploring other countries is fabulous! I've not been to the south of France, but I love France in general! Hope you make it there some day. 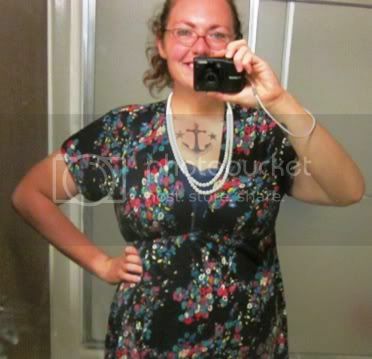 I love the dress and i love the necklace too! Your weight loss has made you one stylish lady!!! Considering how close I live to France, I have never actually been there but everyone I know has been to the South of France and they all love it so much. It's so great that you can bike and stay active outdoors year round. Up here in Toronto it's a much different story, as I'm sure you know from Chicago! The dress looks fantastic on you, btw. Keep up the good work! I love your dress. My new reward purchase will be a new work out bra and a pair of running shoes. It's hard to reward yourself on a budget though. Love your progress!